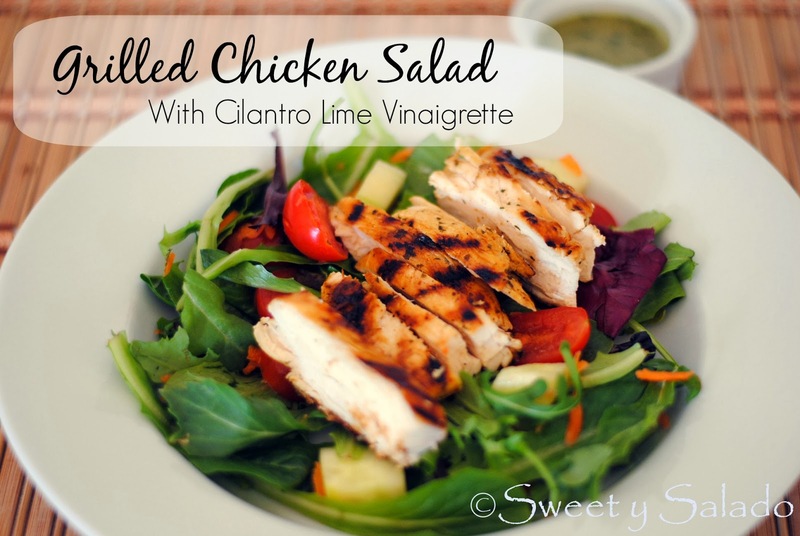 Since it is now the beginning of the year and most of us are on a health kick nowadays, I decided to post one of my favorite chicken salad recipes. I usually make this grilled chicken during the summer because it goes great with anything, grilled vegetables, rice, potatoes, arepas (sure, why not?). But it is also a great option to add to a healthy bowl of mixed fresh greens with a side of your favorite dressing. The dressing is completely optional but I highly suggest you make it because it is crazy good. It has cilantro, lime and honey as the main ingredients and when mixed with the chicken, it is incredibly good. Now, you don’t have to grill the chicken, in fact I cooked it on a grill pan on my stove top, but you can also use a regular pan and it will still come out moist and tender. Feel free to add whatever veggies or other ingredients you want such as broccoli, peppers, cheese, beans and/or chips to give it your own twist. 1. In a small bowl mix all of the marinade ingredients. Set aside. 2. **Optional: Flatten the chicken breasts to about ½ inch thick by putting them in between two pieces of plastic wrap and pounding them with a mallet. This will make it easier to grill. 3. Put the chicken in a small container or plastic bag and add the marinade. Make sure to coat well and refrigerate for about 30-60 minutes. 4. Cook chicken at medium high heat for about 5-7 minutes per side or until all juices run clear. Set aside to cool and then slice it into bite size pieces. 5. To make the vinaigrette, add all of the ingredients, except the oil to a food processor and blend until smooth. Then, while the processor is still running, add the oil slowly. Set aside. 6. Add the mixed greens, tomatoes, cucumber and shredded carrot to a large bowl and mix well. 7. 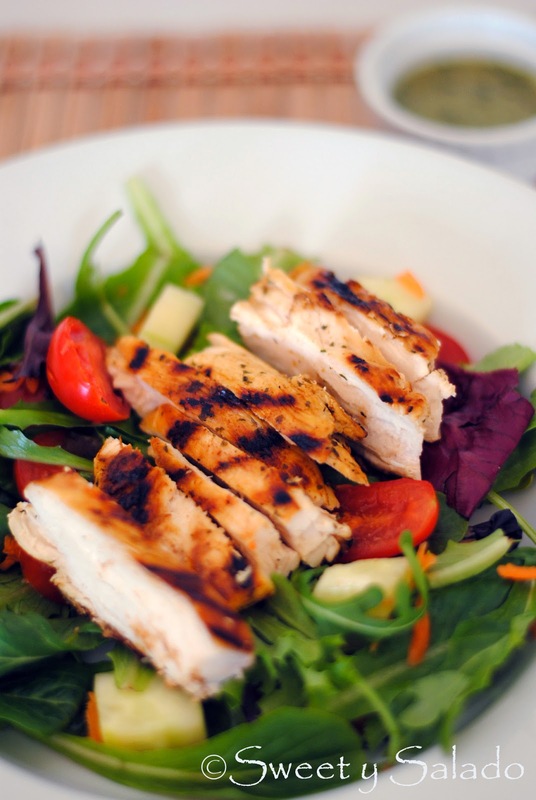 To assemble the salad, serve about 2 cups of the mixed greens with the cool, grilled chicken on top.Serve the dressing on the side. **Note: The vinaigrette can be stored in the refrigerator for up to one week.